Hi, My name is Lydia. I have two German Shepherd Dogs and I couldn’t choose a picture of just one of them. To me, they are both special. 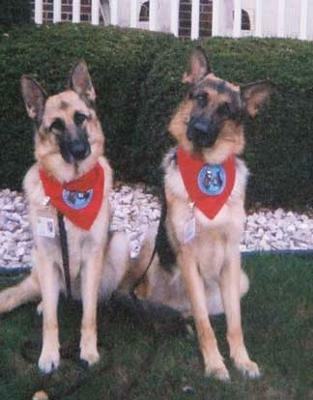 This picture shows both Ekko & Zesty in their Therapy Dog uniforms (Therapy Dogs International, Inc.). Zesty (on your left) is a six year old, female. Ekko (on your right) is a three year old, male. They both have the most amazing temperaments. They LOVE people, children and even get along with other dogs. They enjoy visiting nursing homes and school in their capacity as Therapy Dogs and are always willing to share their love and affection. They truly resemble the definition of a well-bred German Shepherd. do the dogs have kids? I have a year old German Shepherd and would love to train him for a therapy dog, but still see signs of miss behavior in him. I did noticed that your dogs are older then mine so this could be the reason for him wanting to play and yours are already mature enough to take commands. We have been enrolled in training classes since he was about 4 months old and has improved drastically. How long did it take you for the training and to pass the test? I decided on Grizzly (my dogs name) to be trained for therapy dog ever since we went and had some testing done to my husband and therapy dogs were in the hospital, it was amazing how children reacted and were so happy to see them. There are times were I think that I might be asking too much and this is not his nature, so it's wonderful to see that there are some GSD out there that are therapy dogs. My hat goes out to you because I know the hard work that is involve in doing so.